A SCHOOL IN THE COUNTRY Didbrook School in the Parish of Stanway, in the Cotswolds, Gloucestershire, England by Jillian R Mann This history of a rural school in the Cotswolds in the County of Gloucestershire records how the education of children in England evolved from the early 19th century to the present day, with particular reference to the features, advantages and problems of country schools. 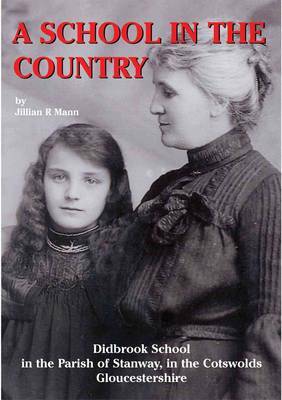 Using abundant anecdotes of past pupils and staff, descriptions of the geographical, political and social circumstances within which the school operated, and many colourful photographs, the book provides a vibrant record of how the life of rural children in England changed over two centuries. Summary This is a history of Didbrook School, a rural school in the Cotswolds. It is situated within the Parish of Stanway, in north Gloucestershire, England. The book encompasses the period extending from the early 19th century to the present day. It describes not only how the education of children in England evolved from the early 19th into the 21st centuries, but also illustrates the particular features, advantages and problems of country schools. Using abundant anecdotes of past pupils and staff and descriptions of the geographical, political and social circumstances within which the school operated, and many colourful illustrations, the book provides a vibrant record of how the life of children living in the country has changed over two centuries. Contents Foreword by the Earl of Wemyss & March Introduction This begins with a brief history, from AD 597 until the beginning of the 19th century, of the education of children in England and Wales, and the pertinent legislation. (For the rest of the 19th century up to the present day these topics are covered in subsequent chapters.) The location of Didbrook School and the geography of Stanway Parish are described, illustrating their relative isolation from urban areas, particularly before the railway line from Honeybourne to Cheltenham was opened in 1906. The demographic changes in Didbrook and the surrounding villages over two centuries are described, and their socio-economic evolution. There is also a section on the author's personal recollections of the school. She, like her parents and siblings, were pupils there. Chapter 1.The History of Didbrook School This chapter describes the day and Sunday schools in Didbrook and Hailes which existed before the present school was built in Didbrook by the 3rd Baron Sudeley in 1870. From 1879 the development of Didbrook School was recorded in detail by successive head teachers, whose records (Log Books) provide much of the subsequent information. Children came by foot from many neighbouring villages and hamlets, up to 3 miles away. The ownership of the school transferred to the Earls of Wemyss in 1890, following an exchange of land between the Stanway and Toddington Estates in 1890. In 1921 Didbrook School was amalgamated with Stanway School on the Didbrook site and continued to educate children of all ages up to 15 years until the Secondary Modern School opened in Winchcombe in 1952. Thereafter, Didbrook School became a primary School. In the 1960s and 1970s Didbrook School absorbed the work of the schools in Stanton and Laverton villages when they closed, but nevertheless by the 1990s falling rolls threatened Didbrook School's future. The causes included falling birth rates, and the use of many cottages as second homes in some of the villages outside Stanway Parish. Closure of Didbrook School and of its nearest neighbour, Toddington School, was fended off in 2008 by their amalgamation as Isbourne Valley School. Chapter 2. The History of Stanway School This chapter describes the education which was supported financially by Viscountess Hereford, the then owner of Stanway Estate, before in 1857 the Earl of Wemyss provided a stone built school, incorporating accommodation for its teacher. The principal sources of its subsequent history were the two Log Books kept by the head teachers from 1863 until the school was amalgamated with Stanway School in 1921. Chapter 3. Teachers at Didbrook School All the head and other teachers identified from the school's records are listed, together with some of the monitors, who acted as assistant teachers. There were three particularly notable head teachers, who between them held the post for 98 years, Mrs Alcock, Mrs Holdsworth and Mr Sanders. Their lives and careers are described in some detail, with many anecdotes about their pupils. Shorter biographies are given of most of the other head teachers in the 20th and 21st centuries. A much loved infant teacher, Miss Last, who was a pupil, monitor and then teacher for 42 years is also highlighted. Chapter 4. Patronage and Governance Both Didbrook and Stanway Schools were 'Estate Schools' and the support and influence of their owners and patrons, the Tracy and Charteris families are described, with many examples. Although it is now a state school, Lord Wemyss still owns Didbrook School and is an active Governor. Many school events have been held over the years in Stanway House and its grounds and other properties, and some are illustrated. Didbrook School was originally run as a Church School and was jointly managed by the Lord of the Manor (or his agent/steward) and the vicar (or his curate) with the help of the school managers. In more recent years the influence of the Church has somewhat diminished, although not disappeared, and governors have replaced managers. All those managers and governors whose names were recorded in the Log Books and other records are listed. Chapter 5. Curriculum and Achievements Against a background of the national trends and legislation on education, which are described, their implementation in Didbrook School is recorded. In the 19th century the teacher was generally single- handed and had large classes, and other problems arose. For example, the itinerant nature of many agricultural workers, who often were hired annually at the Michaelmas fairs, resulted each autumn in a number of children leaving to go with their parents to other villages, while other children would come into the class, whose fathers had been newly hired. Also, many families were very poor and their children would arrive at school inadequately clothed and hungry, and often soaked through from rain. Nevertheless, the head, Mrs Alcock, was usually able to satisfy Her Majesty's Inspectors with the standards achieved in the 'Three Rs' and she and her successors gradually introduced many other subjects, including a wide range of sports. In the 1920s the opportunity arose, because of the introduction of scholarships, for poor rural children to progress to the Grammar Schools and Technical College in Cheltenham (and later in Chipping Campden and elsewhere). Didbrook School has a creditable record of many scholarship successes among its pupils, who are listed. Examples are given of the subsequent careers of a number of them. Chapter 6. Didbrook School in Wartime The effects on the children and their families of the 2nd Boer War and World Wars I and II are highlighted, together with how the wars impinged on the curriculum and other activities. Seventeen men of Didbrook and 12 of Stanway were killed in WWI, and 3 died in WWII; many were former pupils of the school. Therefore, many of the school's pupils lost fathers or other relatives. The children assisted the war effort in a number of ways, particularly by helping with the harvest and gathering fruit. Especially during WWI, older boys took on the agricultural work that normally would have been done by men. In WWII some 70 children of school age were evacuated to the Parish and attended Didbrook School; these are listed. Chapter 7. Child Health and Welfare The laws relating to school attendance and child welfare are summarised and the various impediments to implementing them in a rural setting are described. These included children acting as beaters for pheasant shoots and following the local fox hunt instead of going to school! Also, child labour was required by the local economy and to supplement family income in the 19th and early 20th centuries, so this affected school attendance too. In the 19th and early 20thcenturies infant and child mortality was high, particularly from infectious diseases, which also led to significant school absence. These problems were much reduced after the immunisations, which are routine today, were introduced and antibiotics became available. It is notable that vaccination against smallpox had been introduced in the Parish in the 19th century, so not a single child caught this deadly illness when there was an epidemic of smallpox in the workers on the new railway line in 1904. The introduction of other aspects of preventive medicine, through the school nurse, doctor and dentist is also described. 'Industrial' accidents to children working on the farms were common in the 19th and early 20th centuries and these are chronicled, as well as other accidents and injuries. The effects on children of poverty, or of death of a parent are also illustrated. Chapter 8. Isbourne Valley School This chapter describes the amalgamation of Didbrook and Toddington Schools in 2008, when they became Isbourne Valley School, up to its first and successful OFSTED inspection in 2010.